Beeman is a distributor of fine airguns from air rifle to air pistols as well as Beeman's high quality airgun pellets. Their airguns are imported from companies such as Weihrauch and their pellets are manufactured by Haendler & Natermann of Germany. Weihrauch air guns are among the finest airguns available anywhere. Beeman has been supplying fine pellet guns to airgun enthusiasts for over 50 years. They offer many fine air rifles such as the R1, R7, R9, R11 and RX2. And for the competition minded shooters, choose from the HW77 or HW97 which are excellent airguns for field target competition. Beeman airgun pellets are know by common names such as FTS, Kodiak and Field Target Specials. The Beeman pellets come in all shapes such as the domed, pointed, wadcutter and hollow point.and are manufactured by Haendler & Natermann of Germany. Haendler & Natermann have been making top quality airgun pellets for over 60 years and their offerings continue to change with the new airguns available. Beeman also supplies airgun scope mounts from Sportsmatch of England. All the Beeman scope mounts have a top quality finish to match their air rifles. So whatever, your airgun needs form air rifles, air pistols, airgun pellets and scope mounts Beeman has a quality offering for you. For the shooter who wants a scope mount with absolute maximum clamping ability and the extra height for the larger scopes, this is it! The one-piece construction affords the greatest area of grip, and the four screws along the side give even clamping pressure for a sure hold.. Made from the finest materials, the mount has an attractive matte finish. For use with all one inch scope tubes and objectives up to 56mm. 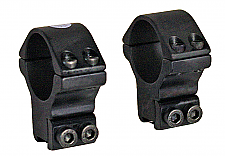 This one piece double screw mount is adjustable for windage and elevation. It's suitable for all spring guns or semi auto rimfire rifles as well as some pre-charged pneumatic air rifles. The maximum amount of adjustment is 2mm from one end of the mount to the other. This applies to the windage and elevation and 60mm diameter objective lens will clear on most rifles. Removable arrestor pin included. Also sold as the Sportmatch APO55 1 piece adjustable mount. For the shooter who wants a scope mount with absolute maximum clamping ability, this is it! The one-piece construction affords the greatest area of grip, and the four screws along the side give even clamping pressure for a sure hold. The recoil pin is invaluable for use on the piston airguns to prevent scope creep, yet is easily removable for use on any other model of gun. Made from the finest materials, the mount has an attractive matte finish. For use with all one inch scopes with objectives up to 45mm. Extremely accurate competition and training pellet for performance-oriented shooters. Tight shot groups, clean-cut holes make this the ideal paper target pellet. 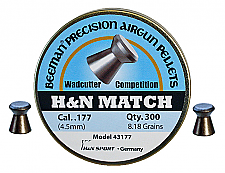 The Beeman H&N Match pellet provides excellent value for the money. The H&N Match has a smooth skirt. This is a great pellet to use in air pistols and light to medium powered air rifles. As one of the world's heaviest pellets, the Kodiak has a tremendous amount of inertia that delivers super impact on those "hard to knock down" targets. The great weight also provides good wind resistance and is more efficient in the higher powered spring airguns and especially in the pre-charged pneumatics. The head is semi-rounded with a hollowpoint, providing outstanding knockdown performance. This is one of the top pellet choices for airguns hunters. Look seriously at this pellet if you shoot a super magnum airgun. The Silver Arrow is a heavy pellet for use with the most powerful airguns. Although the heavy weight will lower the velocity, they shoot with greater stability and impact than lighter weight pointed pellets. The triple rings seal the pellet in the bore helping to lessen in-flight wobble. The Silver Arrow is best used in short to medium distances where maximum penetration and shock are desired. The Silver Bear was the very first hollow point airgun pellet ever designed, and remains popular to this day. A two year development stage resulted in pellet that really expands when used in magnum air rifles. It just gets larger and larger on impact! Even guns of power can benefit from the design of the forward cup which allows for maximum impact even at velocities too low for expansion. The unique head also has a sharp edge that can cut a clean hole in a paper target or catch the edge of a silhouette. In fact, it could be considered a semi-wadcutter.